I’ll be honest – I didn’t even know this was happening until Legoman offered my partner and I free tickets to Taste of Sydney. 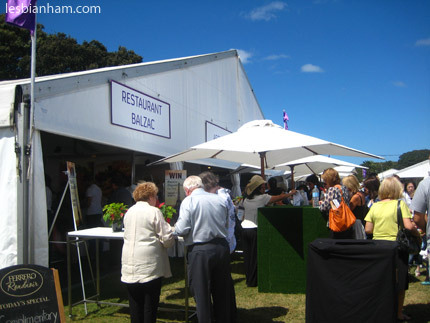 A quick Internet search later, I found out that Taste is a festival that showcases dishes, drinks and food products from Sydney’s top restaurants and various food producers (boutique and otherwise). For myself, the biggest lure of the event was the opportunity to sample the tasting menu of various fine restaurants I can’t afford. This year it was held from March 11th to March 14th at Centennial Park. My partner and I went to the Friday afternoon session to avoid big crowds. We were running late so we just grabbed a cab to get there. We had a nice conversation with the cabbie until he turned out to be racist. Awesome. The event uses books of vouchers called “Crowns” as its currency, with the price being 1 Crown = $1. Dishes on the tasting menu costs 8, 10 or 12 Crowns. 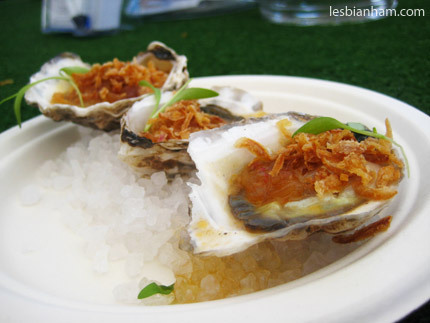 Our first dish was Assiette‘s Sydney rock oysters with “Vietnamese dressing”, crispy deep fried shallots and baby coriander. Ohhhh man our tasting went off to a great start. The textures in this were absolutely divine. I like my oysters naked, so I was happy to find that the dressing complemented the flavour of the oysters instead of overpowering them, which I tend to find with most oyster dressings. This was my SO’s pick – Restaurant Balzac‘s “crispy wagyu beef with wild mushroom and truffle foam”. The foam was more sauce-y than foam-y, but in this case it’s a good thing. The beef inside the crispy pastry was melt-in-your-mouth tender and all the cliches you expect from an uninformed foodie wannabe trying to describe really good beef. I was hungry so I went straight for carbs after the first two dishes. 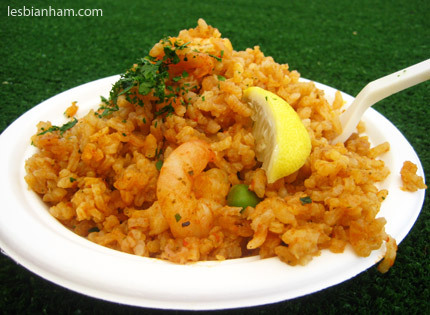 The paella from El Toro Loco didn’t disappoint – it had generous portions of seafood and the dudes at the stall provide entertainment with all the good natured shouting. They had a gigantor paella pan to feed the hungry masses, which I didn’t take a photo of because I was greedily scoffing down food at the time. 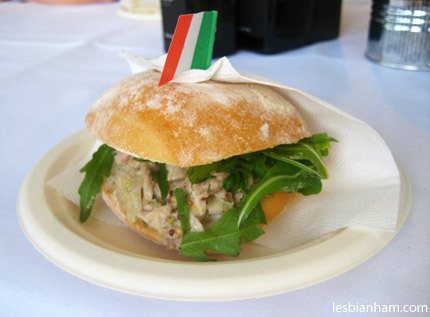 Soon it was time for the SO to pick a dish again, and he went with a “suckling pig panino with apple, mustard and rocket served on Sonoma sourdough” from Pilu at Freshwater. I wasn’t terribly convinced by the description, but I changed my mind pretty damn quick once I had a bite. The pork was perfectly tender and both the rocket and apples cut through any potential greasiness from the suckling pig fat. I was pretty much ready for some dessert but my SO convinced me to try a couple more things. Truth be told I didn’t need much convincing – I was already mumbling “we can always buy more crowns…” every 5 minutes. 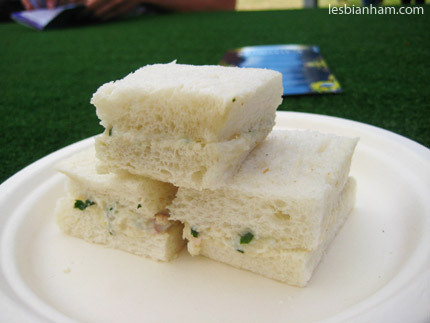 This was my pick – mini sandwich with blue swimmer crab meat and coriander mayonnaise (Guillaume at Bennelong). Man they weren’t kidding about the “mini” part. I’d started to whinge about the value – this was 10 Crowns – when I had a bite. This was awesome. Words literally failed me as my complaints died along with any resolution not to spend too much that day. We took a break from eating and got a cider and a beer from Little Creatures. “Hey,” said my genius SO. “Let’s go look at alcohol samples”. 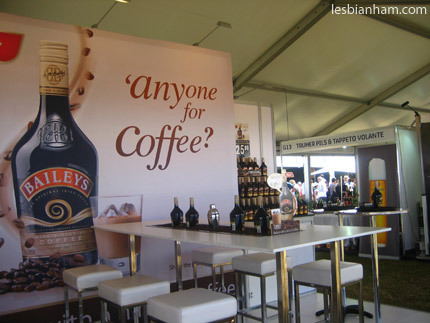 We went around the nearby stalls and had a sample of Bailey’s with a Hint of Coffee. I thought it was OK but SO couldn’t really taste the coffee. Then we had a taste of Glayva (which I liked). 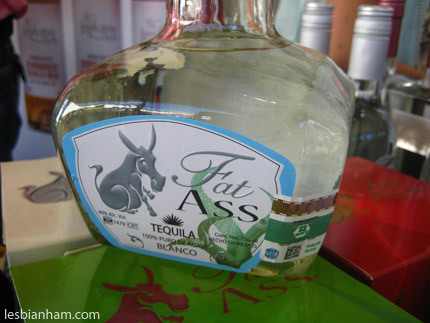 Mmm delicious alcohol. 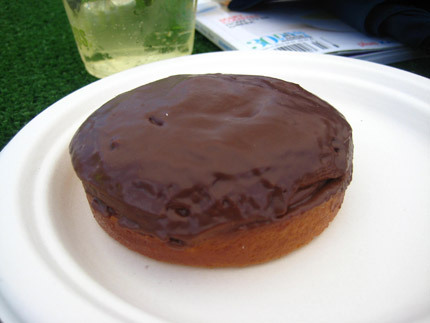 Then I nagged the SO to go to the Danks St Depot stall with me so I can get a saucy tart. “Oh,” you say, disappointed. “Why, that’s just a chocolate tart”. Oh but it is more than a chocolate tart, my pretty. It’s sweet, rich chocolate mousse in a crispy shell and liquid raspberry centre. Ohhh yeahhh A+ my favourite for the day. I’m shedding tears at the fact that I don’t have one in front of me right now. We wandered off to sample a couple more desserts. Purely by accident, we walked past a few more places with alcohol samples. This was where I tried the Aviator gin. It was delicious. 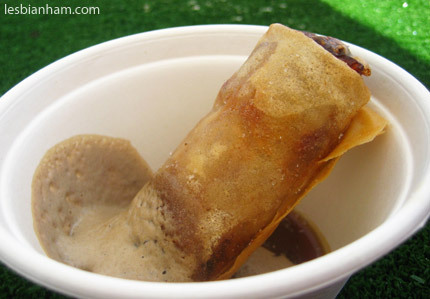 They also had this but I didn’t try any. 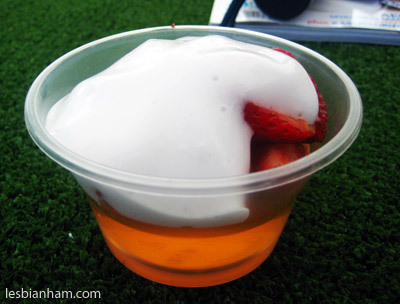 I tried some strawberry cream tequila from another stall and it was disgusting. This is my SO’s kind of dessert – something refreshing and palate-cleansing. Strawberry jelly with champagne foam by ARIA. At this point I was a little bit more than slightly tipsy. 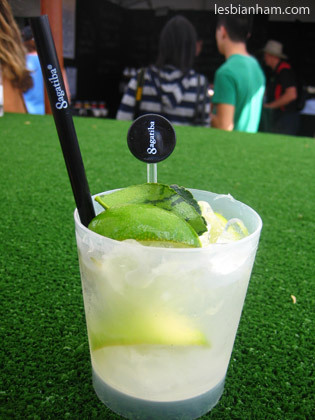 Gimme a break, I have a small liver okay. Last dessert of the day – tiramisu roulade with Marsala sabayon from Bird Cow Fish. The caramelly sauce is especially delicious, though at this point a heavy dessert was probably a bit too ambitious for me. Whatever, I finished it anyway. 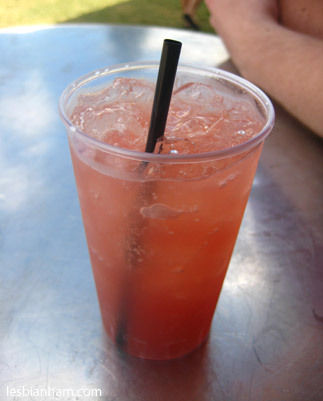 …and a cocktail called “Peachy Keen” (Bombay Sapphire, Rose, French Earl Grey, Peach) from the Etch bar for me. Then we wandered around slightly drunkenly and looked at everything else that was on display. The festival definitely had something for everyone – there were stalls for crockery, whitegoods, cake decorating and even, uh, Nandos. I had a great time and everything I had was brilliant, but I have to say that it was pretty expensive. My SO and I shared everything, but we ended up getting $90 worth of Crowns and we also spent money on drinks. I don’t think I would have gone if it wasn’t for the free tickets, so thanks Legoman. Thegoman. Sounds like you had a heap of fun, food & money spent! Great day, huh? 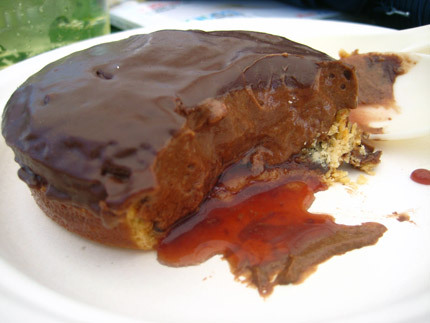 Love the pic of the saucy tart! Very saucy indeed and your photo is making me regret not getting it. 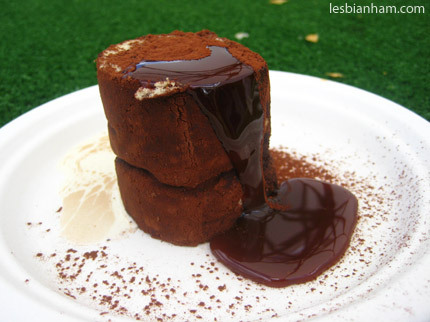 But I got the boobie pannacotta instead Glad to see you back and posting again! You were there on Fri arvo? We were all there too! 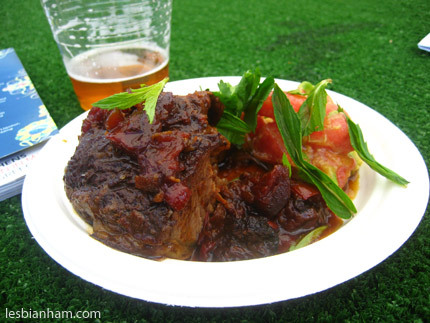 Shame you didn’t try the wagyu daube from Guillaume – that was the best and my clear fave. LOL at racist taxi driver! I didn’t know about this until the last minute either, but will definitely keep a look out for it next year. I’m really hungry after reading your post. Simon – I didn’t really have high expectations but it turned out to be a whole heap more fun than I thought it would be. Karen – For some reason I thought you guys were there for the evening session so I didn’t look out for you, whoops! Bartek – Yeah I’d def try and make it again next year (hint hint), it was pretty brilliant. Betty – The tart just defies description, I loved it! Can be a pricey event by the looks of thigns! Oh looks like you found all the festival highlights. I keep hearing about how good the crab sandwich and the watermelon ribs were. The saucy tart sounded amazing too! Oh dear god, I would have been frozen on the spot, unable to decide what to eat first. I am now filled with food envy instead of suckling pig panino and chocolate tart. 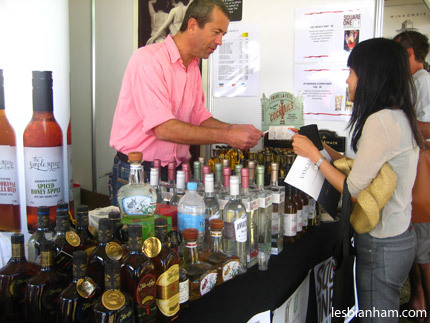 apparently there was a stand showcasing elderflower liquor, did you see that? my friend brought home a bottle for me – tasted like lychee syrup, was absolutely delicious!! @Helen – I didn’t try the panna cotta though and that was what everyone else’s favourite was. I kinda felt like I missed out but my waistline thanks me for it (though not for the tart). I didn’t get to go but looks great! Thanks for the pics!